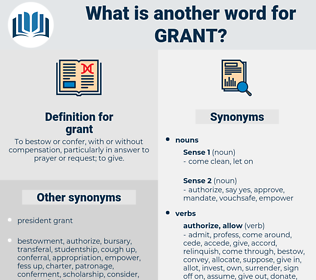 What is another word for grant? To bestow or confer, with or without compensation, particularly in answer to prayer or request; to give. Knights, disasters, submissions, Inquiries, demands, holdings, Policies, concession, concessions, gratien, allowances. Conferring, Permitting, Subsidizing, accords, Involving, Devoting, paying, keeping, subsidising. Pertaining, accords, are, confer, acknowledge, attach, afford, admit, concede, lend, agree. warrants, allows, relates, deserves, requires, attaches. lay, authorized, authorised, confer, attach, afford, allot, acquiesce, admit, subsidize, ratify, authorise, endow, concede, accede, lend, agree. approved, acknowledged, acknowledge, extend, approve. resume, confiscate, appropriate, retain, seize. contradict, reject, dissent, deny, hold, conceal, keep, condemn, dispute, take, fight, disavow, refrain, renounce, refuse, protest, disagree, repudiate, withhold, disallow, hide, disapprove, veto. I readily grant you that.
" Larry Grant," said Clavering. award, awarding, grant-in-aid, block grant. grant-in-aid, appanage, apanage, land grant, subsidy. apportionment, parceling, apportioning, allocation, assignation, allotment, parcelling. assistance, aid, transferred possession, financial assistance, economic assistance, economic aid, financial aid, transferred property.